It’s official. Blondes have more YUM! You know, how it is when you bite through a thin crispy crust, to find a soft, sweet, cakey, centre, loaded with just melted dark chocolate chips. I mean, basically, I’ve just described food heaven, right? 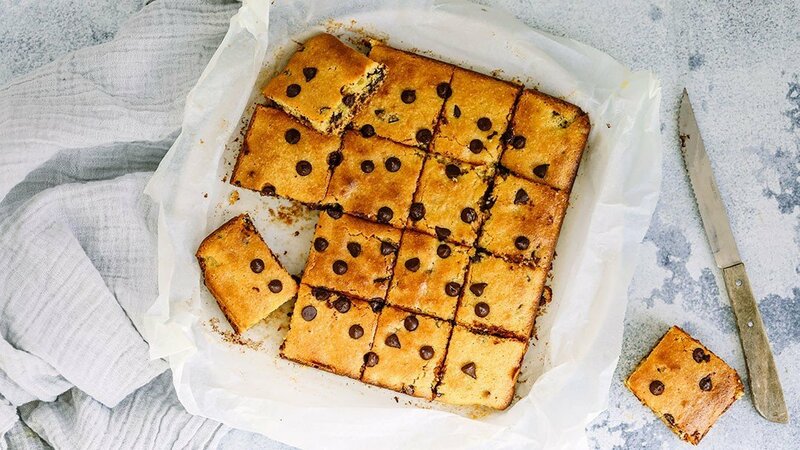 That’s chocolate chip blondies. Low in refined sugar, but absolutely taste like dessert. Gluten free and most definitely do not taste like carboard. Easy dairy free alternative (further evidence coconut oil solves all problems). Loved by people who poo poo low sugar, gluten and dairy free food. Ha! These blondies. They are amazing. Now I know, I tend to say that about every recipe. And that probably gets really annoying. Because on a scale of amazing not everything can be a 10. But, if there was ever a time to believe me. It is right now. Because, for a low sugar treat, these are a perfect 10 (unless, you deduct points, for definitely not being able to stop at one, and in that case, they are a 9.999). Make them and let me know what you think on a scale of 1 to 10? 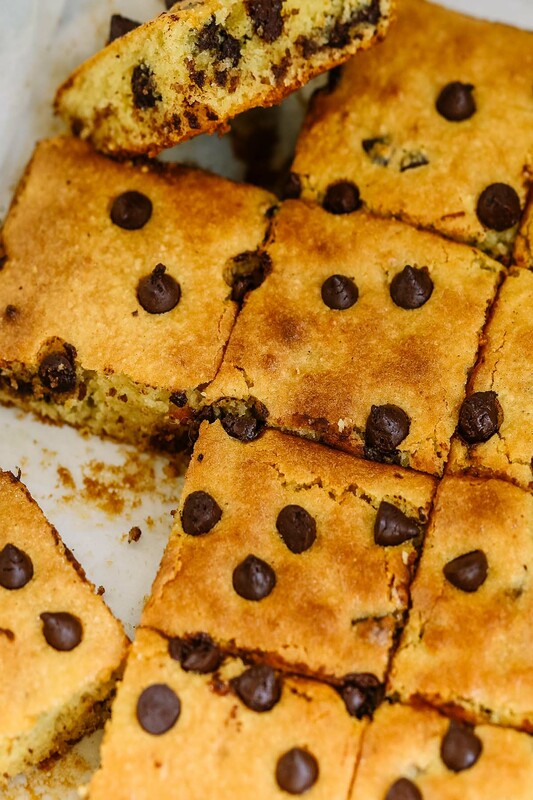 And if you like peanut butter, check out my recipe for peanut butter blondies. I like these ones more, but if you’re up for a challenge, try them both and let me know what you think. Preheat the oven to 180C and line a square cake tin with baking paper so the paper is overlapping the edges of the tin. Melt the butter/coconut oil in the microwave and set aside. In a large mixing bowl, add the almond meal, eggs, rice malt syrup, vanilla essence and butter and stir until all the ingredients are well combined. Fold through three quarters of the chocolate chips. Pour the mixture into the lined cake tin and press the remaining chocolate chips into the top. Transfer the cake tin to the oven and cook for 20 minutes until the top is golden. Remove from the oven and cool for 10 minutes. 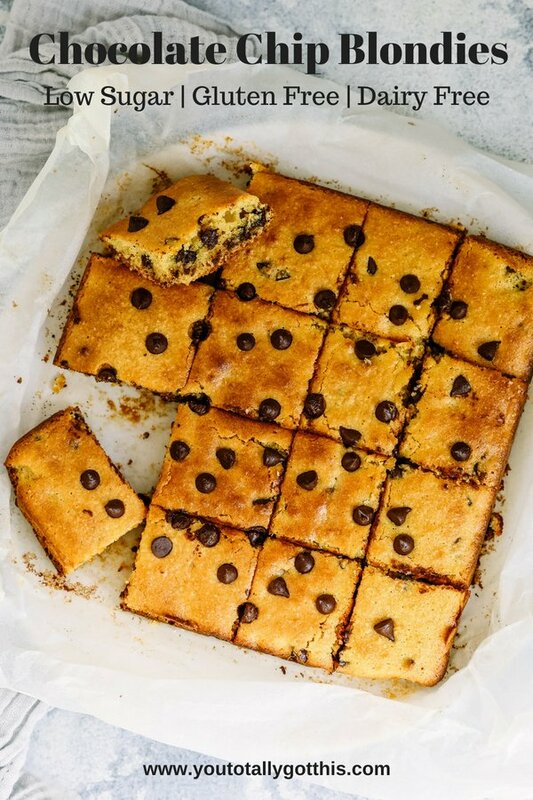 Once cooled, use the baking paper to lift the blondies out of the cake tin and cut into 12 squares. 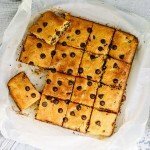 You can easily make your chocolate chip blondies totally refined sugar free, by using a sugar free dark chocolate, like Lindt No Added Sugar Dark Chocolate or Loving Earth Chocolate for a dairy free option. If you can’t find super dark chocolate, just substitute 50g of dark chocolate cut into small pieces. Easy! The blondies will stay fresh in a sealed container for about 5 days. P.S – Now we’ve got your snacks sorted, let’s get dinner sorted too. Grab your FREE quick and easy weeknight dinner plan right here. Oh Cassie that made me laugh out loud. Hope you enjoy the blondies. I think I can pretty safely say, you won’t want to get the taste of these ones out of your mouth.